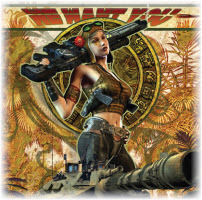 In this issue: a raw recruit is given the chance to become a hero, a young woman tests her mettle, and a bounty hunter must choose sides in a war he didn’t start—but may have to end. Plus, a new contest! Roy Olfetrie planned to be an officer in the Republic of Cinnabar Navy, but when his father is unmasked as a white-collar criminal, Roy has to take whatever he can get and take it fast. Which turns out to be an assignment to accompany Captain Daniel Leary and Lady Adele Mundy as they go off to start a war that will put Roy at the sharp end. Olfetrie doesn’t know it yet, but he’s actually been given the chance of a lifetime serving under the best of the best. It’s a chance to prove himself—not for what he has, but for who he is. The action doesn't slow—nor can Roy. 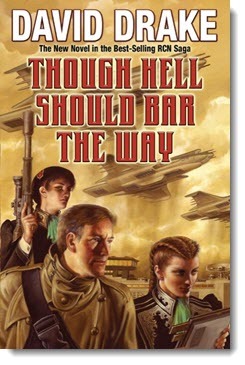 For Captain Leary has given Roy a chance, and Roy is determined to make the most of it—though hell should bar the way! Get Though Hell Should Bar the Way here. In an alternate America, where magic works, Sarah Calhoun has paid a hard price for her entry onto the stage of the Empire’s politics. But she has survived. Now she rides north into the Ohio and her father’s kingdom, Cahokia. To win the Serpent Throne, she’ll have to defeat seven other candidates, win over the kingdom’s regent, and learn the will of a hidden goddess—all while mastering her people’s inscrutable ways and watching her own back. When someone starts killing his fellow bounty hunters in the port of Fairhaven, Drago Appleroot is happy to help his contacts in the City Watch with their investigation—for a reasonable fee, of course. Pitched into a maelstrom of treachery and lethal politics, Drago is forced into a long and dangerous journey to the heart of the Sylvan Marches, where one determined gnome might just decide the destiny of a kingdom. 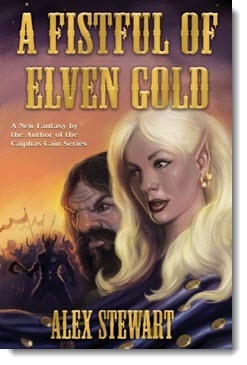 Get A Fistful of Elven Gold here. This is it, the climax of the internationally best-selling Honor Harrington series—and Honor is in top form. The time has come: the Manticoran Star Kingdom and its allies go to war against the massive and corrupt Solarian Empire. After a tragic loss, Honor Harrington enters the fray once again. 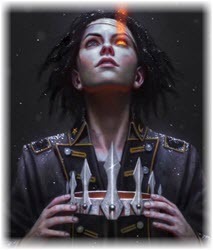 She’s filled with steely resolve, possessed of cold competence, and motivated by a fiery determination to the take the fight to the enemy and end its menace forever. In the new novel Witchy Winter, D.J. Butler reimagines American history with a touch of the fantastic. Butler is also an accomplished singer-songwriter who has released an album of songs inspired with the world of Witchy Winter and its prequel Witchy Eye. Which got us thinking: how might some of America’s beloved patriotic songs sound with a fantasy twist? So we’re asking you to rewrite a classic patriotic tune with fantasy-inspired lyrics. Would Yankee Doodle Dandy be a wizard? Could those purple mountains hide a dragon’s horde? Give us your take for a chance to win a signed copy of both Witchy Eye and Witchy Winter. In celebration of the all-new anthology Star Destroyers, we asked you to tell us your favorite space-faring warship. Congrats to Jeremy Range. 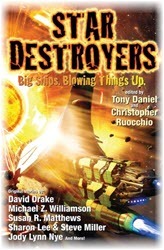 Jeremy wins a copy of Star Destroyers, signed by editors Christopher Ruocchio and some of the contributors. 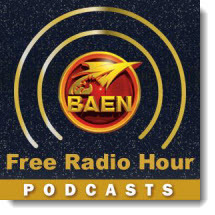 Coming soon to the Baen Free Radio Hour: David Drake discusses new RCN series science fiction novel Though Hell Should Bar the Way, and D.J. 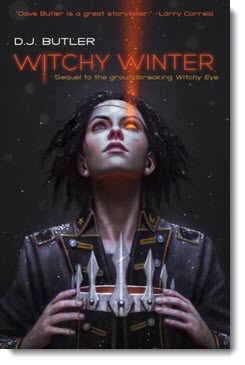 Butler on Witchy Winter, sequel to his magic and muskets debut novel, Witchy Eye. Missed past episodes? No problem. We’ve got every episode archived for your listening pleasure. 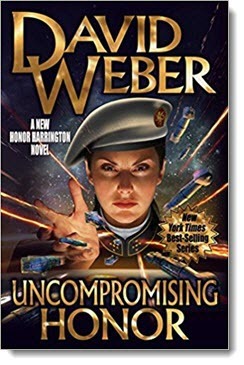 Roy Olfetrie planned to be an officer in the Republic of Cinnabar Navy, but when his father is unmasked as a white-collar criminal, Roy has to take whatever he can get and take it fast. Under the command of Captain Daniel Leary, Roy will make the most of the opportunity fate has dealt him—though hell should bar the way! Sarah Calhoun has paid a hard price for her entry onto the stage of the Empire’s politics. But she has survived. Now, to win the Serpent Throne, she’ll have to defeat seven other candidates, win over the kingdom’s regent, and learn the will of a hidden goddess—all while mastering her people’s inscrutable ways and watching her own back. When war erupts, the fate of a kingdom rests in the hands of a bounty hunting gnome. If only he could decide what side to take! The Sleeper Wakes. The Core Taps may have solved the energy crisis, but when activated they disrupt brain waves, sending everyone nearby into a deep, forced sleep. Rafe Harald is one of the few humans not affected by the Core Taps. He’s looking for a missing colleague. What he finds is a conspiracy so devious in its design, he’ll wish it was a nightmare. Don't forget to check out the newest ebook releases here. Plus a new short story “The Midshipman” by David Drake here. And read this month’s nonfiction essay, “Magic Systems aren’t Magic” by D.J. Butler here.